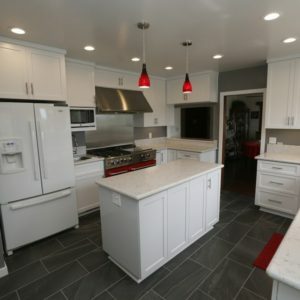 Depending on the scope of your project,Kitchen remodeling in Whittier CA has the potential to involve many challenging tasks, from installing perfectly level countertops and cabinets to rerouting plumbing and gas lines. Naturally, you need an experienced contractor like Cabinet Magic to make your project a success. At Cabinet Magic, we have over 30 years of experience in cabinet fabrication and remodeling. We know exactly how to get you the high quality products you need and manage all the moving pieces of the project so that the work gets done on time, on budget, and with superior quality craftsmanship. Kitchen remodeling in Whittier CA sometimes requires a leap of faith as you go from your sample selections to the real thing. For example, you may worry that your flooring and countertop won’t complement one another like you’d hoped, or that the color you’ve chosen for your cabinets will be too dark once a whole wall of cabinetry is installed. At Cabinet Magic, we understand how important having an accurate visualization of the finished kitchen remodeling in Whittier CA is for your comfort and peace of mind. That’s why we offer 3D computer rendering services on every remodeling project. We’re happy to create multiple versions of the design so you can easily compare different options. We never begin work without your sign off and approval of every detail of the design. The centerpiece of any kitchen design is the cabinetry. With Cabinet Magic as your remodeling contractor, it’s easy to get the exact look and functionality you want from your cabinets, because we have an entire factory dedicated to custom cabinet making. Our skilled craftsmen can create any style of cabinetry and of course you will have your choice of finishes and accessories. Our cabinets are sturdily built to stand the test of time and incorporate high end features like soft-close hidden hinges and smooth drawer slides that make them a pleasure to use. If you are interested in working with Cabinet Magic for your kitchen remodeling in Whittier CA, please give us a call at 800-828-4380 so we can set up a free in home consultation with one of our knowledgeable team members. We’ll go over your wish list with you and provide an estimate for the necessary remodeling work.